Two young kids standing in front of two massive towers, immortalized forever in a Polaroid print. That’s how I like to remember the Twin Towers. A group of American students, with French exchange students, ascend one of the towers in the network of elevators, stopping in one of the mezzanines for a photo, before climbing to the top. Eventually, the group reaches the top of the massive tower, at dizzying heights…not permitted to view from outdoors that day, because it is too windy. After grabbing a view of the endless outdoors from the massive windows, the group descends the elevators, for the return to ground floor. In the mornings, the sunbeams onto the towers, majestically presiding over the Hudson River, as the commuter bus makes its way to the Lincoln Tunnel. In the evening, lights twinkle inside the buildings, offering an elegant view from the city’s departure. A beautiful Saturday in 1999…a Bar Mitzvah celebration in Brooklyn on the waterfront…the Twin Towers add to the magnificent backdrop, and a plethora of photos are taken. Taking in some tourism a sunny summer’s day in New York in 2000. Crossing the Hudson via ferry affords a picturesque view of those twin companions, as they again stand guard over the river. Driving on one of the streets of Boonton, New Jersey overlooking Route 287, they were visible, majestically peeking from the clouds. They were also visible from the car on Route 80 East in Parsippany. On a cloudy day, they were shrouded, giving an indicator of what the weather may be like…or they would magically appear later on, as the haze burned off. But anymore, I often and sadly don’t remember them that way. On September 11, 2001, all that remained along the horizon from the Boonton office building where I worked at the time was smoke that billowed in the distance. I thank God I had a change in plans the Friday before on September 7, and that I decided that September 14 would not be my last day of work before maternity leave. I hadn’t been feeling well, and didn’t think I could make it, and on the night of September 7, was in Morristown’s Emergency Room, concerned I was in labor. That wasn’t the case, and my pregnancy induced hypertension and gestational diabetes had been acting up, triggering other symptoms. Had I gone into labor on September 7, I may have actually been in the hospital when Morristown was setting up as a potential center to take those injured. Had I been at work on September 11, I would have been the one reporting to others what I saw from the window that morning…as was being reported to me. Today, I still can’t stomach that thought. On the morning of September 11, I was supposed to be home with my feet up, with a quick lunch in between with a couple of retired co-workers at The Lafayette House. I called up Sprint to pay my phone bill. I remember the operator seemed almost distant in her voice as she took my information, and I found it curious why her tone seemed almost reserved, and sullen…while the reps were usually very upbeat. 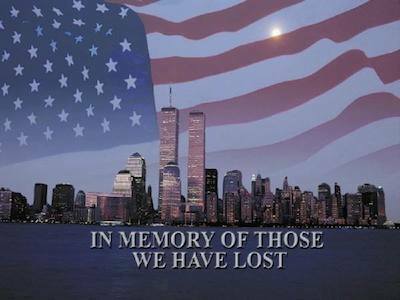 I ironically emailed my friend, Barbara, who worked within the World Trade Center area, wishing her a wonderful day. Little did I realize what kind of a morning my friend was having. I hadn’t turned on the television yet. I made the mistake to decide to settle into the recliner for a bit for Regis and Kelly. But there was only “snow” on ABC. I switched to Fox and experienced the same thing…the same with NBC. It was CBS though that popped up with the horrific site, because they had a transmitter that was not on the building. Was it a movie? It was so surreal it couldn’t be real? Those beloved towers, rising up from the ground at the same time that my parents carried me through the door of our New York apartment in Chelsea for the first time, not too far from where the massive buildings would rise above the city. Now, I watched the buildings aflame and suddenly realized that some loved ones were missing, and the strange timing of my email to Barbara around 9:30 a.m. as she turned out to be running for her life. The phone lines were jammed, and I couldn’t reach them. So many others who watched helplessly from their armchairs on the home front experienced the same thing. Calling my office was how I learned about the Pentagon and Shanksville, as the trouble unfolded as we were on the phone, and news was being communicated via word of mouth from television sets around the nation. It was in the days prior to texting, Twitter and Facebook, though the Internet still connected people quickly, though not as quickly as today. Could you imagine the photos, videos, posts and Tweets that would have emerged had we had that technology then? Watching from my seat, I guess I could say I had a “Pollyanna” type of approach to life, imagining that everyone would be coming out safely. That’s what a person’s mind wants to believe. But then the unthinkable happened, as I remember the newscasters gasping while we watched head on as the first tower buckled and then collapsed in a shower. I still wanted to believe that everyone evacuated safely. And then, the second fell along with its sibling, and this emptiness just filled my heart, with an overwhelming sadness that still stings my eyes with tears, and forms a lump in my throat, close to 14 years later. Sometimes, I don’t feel I’ve left my armchair, on each anniversary, but I’m still sitting there. That day, I couldn’t find my aunt until later, and couldn’t find my friend…who ended up concerned the city was being bombed, and was making her way to the East River, to possibly jump in. She ended up losing her shoes along the way, crying as she forged her way uptown, with those uptown in their own world, going about their day, and even lunching calmly in cafes as if the chaos downtown never happened. 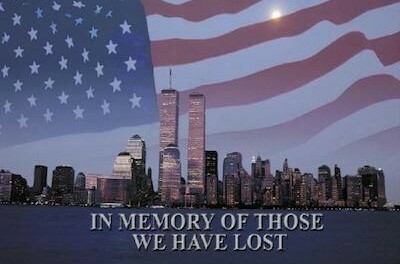 I still shudder when I think that one of those planes that hit the towers flew over my neighborhood that day after being hijacked and careened into them. And then the silence in the skies as flights were suspended for days afterward. As a journalist, sometimes I need to decompress as the sadness washes over me, and I attend annual memorial events, and retell stories for others. When I was with LH!Weekly, to have written of the stories of bravery was an honor for me, yet heart wrenching. One of the men that I interviewed had bared his heart and shared an horrific story as a worker in a nearby building, and having one of the flight attendants still ziptied into her seat, landing atop of his rooftop. Her purse was still in her hands, which he brought to authorities to identify her, before he trekked back to Jersey in an odyssey. After that story, plus interviewing an elevator repairman who was in the towers that day as well, my heart ached for them and what they had endured. There are so many other stories, and lives whose paths have crossed mine over the years, including police officers who I’ve become acquainted with, who worked in New York or New Jersey, and tended to the situation, or the aftermath…some with loved ones or colleagues who perished that day. I never made it to lunch that day on September 11 either. It was too strained a day…how could we concentrate on enjoying lunch in the midst of those happenings? As it was, one of the ladies had worked at American Express in the World Trade Center, and was worried for her former co-workers. The other woman feared for her daughter-in-law, who was on the way to Denver, and had her flight grounded. She and some strangers who also needed to make their way back to Jersey ended up acquiring the last rental car around Chicago, where they were forced to land…and returned home. What was an interesting perspective is our ringing phone throughout the day. There was a strange unity that developed, where we received phone calls from loved ones, just checking to be sure that we were personally nowhere near the activity in New York, though we had absolutely no plans to be there. There was a genuine concern in each and every person, in a day and age when most are out for themselves. No one knew what was next, and it is strange to look back at the events that unfolded. Hearing NJ Burkett tell his story at Sussex County Community College was another touching point in my life. Poor NJ has since been accused by the conspiracy theorists that accuse him of involvement in the disasters, because of his broadcast that day, and barely making it into a building with his cameraman as the first tower buckled. Others whose path I’ve crossed have been the Naudet brothers, who were filming the documentary with the fire department that day, and who have also been attacked by these types. And then of course, there are the other conspiracists who try to claim that none of this happened at all. That’s an insult to every single life that was sacrificed that day, and I wish they would stop their poison for the sake of all the broken hearts. They are as bad as those who claim that the Holocaust never occurred. I haven’t made my way to the memorial, or to the new building at this point. Years ago around 2006, I walked by the huge barricade that had been in the area near the World Trade Center, but didn’t want to get too close. It hurt my heart too much, especially with the thought that this had been a literal grave for so many people that day. I couldn’t bear to bring myself there. How I’d like to remember the Twin Towers is as one of two smiling little kids, playing in their shadows, as some sun tried to break through, and how I stared up at these massive wonders of the world, to the point my neck ached. How I’d like to remember the Twin Towers is with an excited group of French students, making our rounds in New York City to various sites, and ascending the massive building to the top together. How I’d like to remember the Twin Towers is one Saturday in Brooklyn, as they watched over our festivities, and served as a perfect photo backdrop while we enjoyed the afternoon and celebrated a milestone in a young man’s life. How I’d like to remember the Twin Towers is how they were my gauges those days in Morris County as to what our weather might be like, with their peeking over the horizon on gorgeous days. I will never forget the sense of wonder that I felt that they seemed as if I could reach out and touch them from those approximate 30 miles away. Like what you’ve read here? 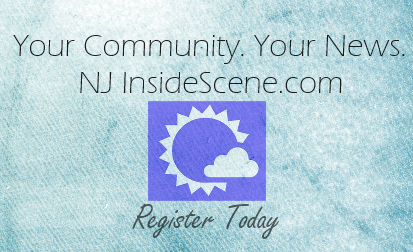 Then stay on the scene with NJInsideScene.com. Click here to follow us on Facebook.